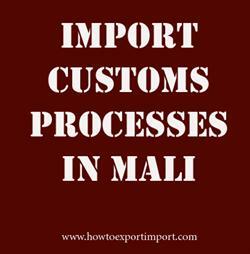 What is the customs process in Mali to import? How is import cargo released from Mali Customs to importer? Who are the parties involved in import customs clearance formalities in Mali? Import cargo clearance in Mali Customs. The information provided here details on how to import goods to Mali especially import customs clearance procedures in Mali. Malian Customs or Mali’s Direction Générale des Douanes (General Customs Directorate) is under the Ministry of Finance and the Economy, established for levies taxes on goods efficiently, implementation of customs policies, facilitate legitimate trade and protection of the society and legal economic activities. Jens Erler: On 03 September 2018 Ist es korrekt das man bei der Ausreise aus Mali eine Kaution von 1500 Euro hinterlegen muss um eine reibungslose Reise zu gewährleisten? How to export from India to Mali?